Sharon and Gordon Greene of The Wild Irish Foragers and Preservers, have been producing a range of syrups, preserves and sauces from their fifth generation family farm in Birr for the past two years. Fiona Dillon sat down with Sharon to discuss the origins of the company, her interest in foraging and their award winning product range. How did the idea of The Wild Irish Foragers and Preservers come about? Ahhh now there’s a question with a long answer. To be honest we never actually sat down and said lets start a business, it just kind of evolved into one! The rekindling of some of my childhood memories of wild food and ‘picking’ as we called it then came from a blackberry picking session with my two youngest Stuart and Emily about seven years ago. At the time they were nine and eight years old. On that blackberry picking afternoon Emily looked up into the hedge and asked “Mum, what’s that?” as she pointed to the rich red rosehips. I couldn’t believe my ears and was shocked, and to be honest ashamed, that she didn’t know. Here was a country kid who didn’t recognise a basic wild food. What shocked me more was, as she was the youngest of five and didn’t know, it meant that I had failed to pass on this information to the older four also. I had just presumed my kids would know just because I knew but I hadn’t passed the knowledge on. I had been used to picking rosehips as a child and had also been used to the spoonful of rosehip syrup every morning back then too. We picked some rosehips that day and that night after rooting out some old rosehip recipes I made some, and when Stuart and Emily tasted it for the first time it was in a little cup, still warm from the pot that I had very excitedly brought upstairs to them in bed. 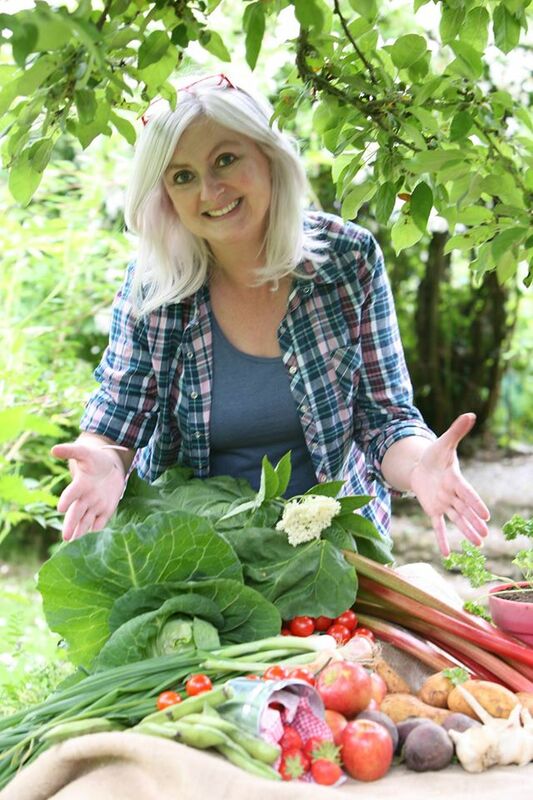 From there my interest grew and grew, I started to look for old Irish recipes for preserving wild food and the health benefits they were used for, and I began experimenting in the kitchen trying out many many recipes. Rosehip syrup and elderberry syrup became staples on the porridge in our house in the morning. About two years ago I decided to take some bottles to the Nenagh Farmers Market and was shocked to sell out very very quickly that day. The next week I brought some more and added a few more of our wild products to the stall and they all sold too. I found that customers were really interested and that they love to have a chat about their childhood experiences of wild food. From there we found ourselves looking at the farm and seeing that we could keep its wildness and still earn a living. Our children are fifth generation on this fifty acre farm and we would like to pass it on to them with hedgerows instead of electric fencing, with grass in the middle of the lane instead of asphalt and with an appreciation of what nature can provide without man’s input. Are all your family involved in the business? My husband Gordon is the main forager and we all help him out from time to time with the picking. When it comes to the topping and tailing and sorting then everyone gets a bucket around the kitchen table. The kids don’t mind doing rosehips, elderberries and so on but when he comes in the back door with gorse you can hear the “ouch” sighs. Gorse can be a very prickly one! Our daughter Jane (21) will hopefully be working more with us in the future. At the moment she does the foraging with her Dad. Stuart (16) and Emily (15) also forage with Gordon and both work at the stall too, as does Jane. The two older boys Norton (24) and Jordan (23) help out when they are home. As a child yourself, were you aware of the bounty in our hedgerows or is this a skill you learned? As a child I remember picking rosehips, blackberries, sloes etc. I can recall the nettle soup at Grannie’s house. I know I used to be able to recognise lots of hedgerow plants but was not aware of all of their uses apart from rosehip syrup. Over the past few years I have learned more and more from delving into the history of foraging in Ireland. There is lots I don’t know, and I reckon I will never learn it all. Having said that though I am one of those people who prefers to know five things well rather than twenty things “kind of” well. How much time is spent in a week actually foraging? Ooooh, Gordon should really be answering this one. When it is our busiest harvesting seasons I guess three days a week could be spent, but having said that, we would only forage when the morning dew has lifted and before evening sets in. We do not forage on wet days either. Once the harvest is picked we would then spend many hours topping and tailing. For example to make our dandelion products we can each only pick say a half bucket at a time and then have to remove all the petals by hand. The reason we would only pick a half bucket is that once you pick a dandelion it will start to close up and it is then very difficult to get the petals out without green bits. If you had asked me how much time is spent talking about and thinking about foraging then I would have said “all the time”. It is lovely to look at the farm in this kind of light and appreciate it. Where are the syrups made and who makes them? All our products are made in the family kitchen and the main “bottlewasher” is me. I make all the products in small batches. From the bottlewashing to the bottle filling it is just me. As I work in the family kitchen it is easier for just one person to work at a time. However when it comes to bottle labelling etc everyone pulls up a chair!!. You use ancient recipes for your products, where did you research these recipes? I have spent hours and hours pouring over old books, talking to people etc. Many a time I have tried a recipe and failed as it would have been originally made on say an old Aga or the likes and won’t adapt to a gas hob. Getting temperatures right when using old recipes can be quite tricky. I imagine all your produce is seasonal, how do you manage this in terms of running a business? We pick a certain amount and leave the rest for wildlife and regeneration. When it comes to having enough stock to see us through the year, we do freeze a lot of it after topping and tailing. Years ago a lot of the wild bounty would have been preserved in pits but nowadays freezing does just as well. We pick on a dry day and freeze the same day. Some of our products like the shrubs for example are preserved in apple cider vinegar (shrubs are an apple cider vinegar base infused with wild berries, flowers and herbs. They were originally used as drinking vinegars) There is so much wild bounty to work with I don’t think I will in my lifetime get to even experiment with them all! Do you ever feel like you will “run out of hedgerows” on your farm? We intend to let more and more of the farm go wild as we go along. Some years harvest can be good and then the following year poor, but we adjust with nature. For example last year was a bumper damson year and this year is not. I make a Wild Damson Fruit Cheese on those bumper years, and on the slack year Mother Nature provides a bumper crabapple so Fruit Cheese then becomes Crabapple Fruit Cheese. Our main ethos when it comes to the farm and to the business is to let the wild on the farm dictate what we do. What I mean by that is whatever the farm provides, then we will work with that. We would up to now have picked perhaps one fifth of a crop but will probably go to one third for this coming season. As the business grows we can pick more but we will never pick all of it and would never want to. We want to live from and alongside nature and not exploit it. The food industry has too much exploitation as it stands. We hope to run foraging walks on the farm next year and hopefully renovate the old mill to provide space for talks, exhibitions, accommodation etc. It has always been Gordon’s dream to have a place where people can come, relax and enjoy the simple beauty of the Midlands. What we hope to do is a no frills experience, just wellies, chat and cook outs. What would be your most popular product? I say this humbly but all seem to be popular. If I was to answer in order of best selling then it would be Elderberry Syrup followed by Dandelion Petal Shrub. The shrubs have really taken off. I absolutely love shrubs. I love their history, I love their many many uses, I love when they are infusing and I have to go through my daily ritual of turning and shaking demi johns for months, I love how a simple wild flower or berry can infuse with apple cider vinegar to create a spectacular unique flavour. Would you like to share the secret of how you have won so many awards for your syrups and condiments? I have no answer for that one, Fiona. I am so grateful for all the Awards we have won but each time is a surprise. We just go out foraging, make products, go to markets, eat, sleep, repeat. Every award we have won is down to Millhouse Farm. Our gates don’t hang straight, the tractor doesn’t always start, the hedgerows are rambling. We have a lot of work to do yet in renovating the old farmhouse, mill and yard but on an autumn evening when we are down the lane sitting under the old crabapple tree in the Fort Field and we look around us, we are so glad that we are protecting this little patch of Ireland and I guess each award has helped us to keep going when sometimes non-conventional “farming” can make us appear a little odd in farming circles.